There is something about sipping Chianti on a vine-covered hillside in Tuscany, and you can do just that on a wine tour from Florence. From learning what Chianti Classico means to seeing the winemaking process firsthand, here are your options. 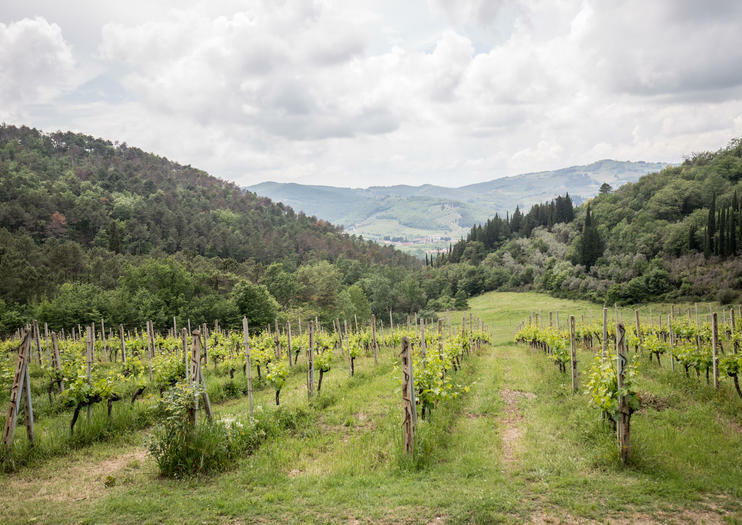 Usually stopping at two wineries, half-day Chianti wine tasting tours from Florence give travelers the chance to experience the Chianti region but be back in the city by dinner. Lunch, on the other hand, is often included in a rural Tuscan country farmhouse, where you’ll sip Sangiovese after touring the cellar and viewing what goes into winemaking. For an immersive Tuscan wine tasting experience, spend a full day exploring the wine region. Combine a visit to local vineyards with walking tours of nearby hill towns to stroll the cobbled streets and learn the history of the Tuscan countryside. Visit some of Tuscany's UNESCO World Heritage sites while also sampling olive oil, cheese, salami, and wine; stand in Siena's Piazza del Campo; check out San Gimignano, or visit the city of Pisa. All tours include meals of classic, flavorful Tuscan cuisine. Half-day tours usually last 5 to 6 hours, while full-day tours run between 10 and 12 hours. The Chianti area is set about 45 minutes away from Florence by road through the rolling hills. Some tours focus exclusively on Chianti wine tasting, while others are true sightseeing tours that also include some wine. Decide which tours work best with your level of interest in winemaking. Keep in mind that most tours involve a fair amount of walking through various towns. Your full-day Chianti wine tour will likely include free time, so bring along some extra cash for souvenir shopping. Choose a convenient guided tour with included roundtrip transport from central Florence so you don’t have to worry about driving after a day of wine tasting (drunk driving penalties in Italy are severe). Treat yourself to a winemaking tour and horseback riding in Tuscany on this 6-hour experience from Florence. Led by an expert guide, ride through Tuscany’s Chianti wine region by horseback, admiring the scenic landscape of vineyards and olive trees as you go. Stop to visit a local wine cellar and hear about the region’s winemaking tradition. Afterward, sit down to a flavorful meal of Tuscan dishes, complemented by smooth Chianti wines. Numbers are limited to six people to keep the experience as intimate as possible. When visiting Florence, don’t miss a day trip to the scenic, gourmet paradise of the Tuscan countryside. On this small-group tour, visit the remarkably well-preserved medieval town of Siena, home to a magnificent cathedral and the famous Palio horse race. Indulge your taste buds with a seasonal lunch and wine tastings at a family-run farm in the Chianti region, and wander the storybook streets of the UNESCO-listed village San Gimignano. Group size is limited to 14 for a more personalized experience. Soak up a unique view of Tuscany on this 6-hour Vespa tour departing from Florence. Led by an expert guide, journey out of the city and hop onto your scooter once you reach the beautiful country roads of Chianti. Stop for a traditional Tuscan lunch at a castle, where you’ll enjoy a tasting of local olive oils and prominent Chianti wines. Your Vespa tour will conclude back at your original departure point in Florence. Experience the best that Italy has to offer with this 5-hour experience combining wine tasting and a Fiat 500 tour. Departing from Florence, hop behind the wheel of a gorgeous 1960s model and journey into the Tuscan hills with your convoy. Then, park your classic ride at a 15th-century wine estate and villa. Soak up the flavor of Italy on a 6-hour wine tasting tour in Tuscany. Departing from Florence, a sommelier guide will lead the way to the heart of the Chianti region, beloved for its deep-red wines and breathtaking scenery. Visit two wineries, sipping and swirling six local blends. Afterward, enjoy a traditional Tuscan lunch and a stop at a charming Italian village before returning to Florence. Numbers are limited to 16 to keep this experience as intimate as possible. Explore the highlights of Tuscany with this full-day tour of Siena, San Gimignano, Chianti, and Pisa from Florence. Walk through medieval streets in Siena and San Gimignano. Have lunch and wine at a Chianti winery. See the town where Leonardo was born and admire the famous Leaning Tower of Pisa. Get a true taste for the Tuscan countryside with this day trip to Siena, San Gimignano and a Chianti winery for dinner. Departing from Florence, venture first to the city of Siena for a guided tour through the Piazza del Campo, the site of the renowned Palio horse races, as well as a surprise food tasting. Afterward, wander the hilltown of San Gimignano before heading to a Chianti winery for a delicious 3-course dinner, complemented by fine local wine. Your trip is reserved to 16 people to keep the experience intimate. Experience Siena and the Chianti region on this 7.5-hour evening excursion, departing from Florence. Bypass the daytime crowds and arrive in Siena in the late afternoon to explore the Piazza del Campo. From there, visit a Tuscan wine cellar in the famous region of Chianti and enjoy a 4-course meal paired with local wines. After a romantic evening in the Tuscan countryside, you will return to central Florence. Experience the architecture, landscape and local flavors of Tuscany on a day trip departing from Florence. Led by a professional driver-guide, visit San Gimignano, Siena, Monteriggioni, Pisa and Chianti’s famous wine region, soaking up each town with a walking tour. Admire the Leaning Tower of Pisa, the Siena Duomo and relax with lunch and a Chianti wine tasting on this comprehensive exploration of Tuscany. This small-group tour is limited to eight people to ensure an intimate experience. Take in the postcard-perfect beauty of Tuscany on this small-group full-day bike tour from Florence. Ride through the Tuscan hills with the wind in your hair and the sun on your face. Keep a relaxed pace to fully enjoy the scenery, and visit two wineries along the way. Get a taste of Tuscan scenery, wine and food on a day trip departing from Florence. Led by a local guide, discover the regions of Chianti and Val d’Orcia, soaking up the local flavor with two wine tastings. After exploring the charming towns of Greve and Montepulciano, top off your trip with a traditional Tuscan lunch at a farmhouse in the Val d’Orcia hills. To keep the experience as intimate as possible, numbers are limited to eight on this small-group adventure. Explore the world-class Chianti wine region on a day trip from Florence. Led by an expert guide, stop in Siena for sightseeing, a light lunch and wine tasting. Learn how regional wines are produced at a prominent Chianti winery. Then, discover the hill town of San Gimignano, famous for its medieval architecture and incredible vistas. Enjoy stops at two more wine villages to sample the local blends before heading back to Florence. Numbers are limited to eight people on this tour to ensure an intimate experience. Sample a true taste of Florence on this 9-hour food and wine tour through Italy’s famed Chianti region. After departing from Florence, you'll explore the cellars of two typical wine estates, and discover the picturesque Medieval towns of Greve and Castellina before enjoying an evening meal in a local village tavern. Your tour leader provides insightful facts and anecdotes as you taste and travel. Upgrade your experience to include an authentic Florentine steak with your dinner. Get a true taste of Italy on this half- or full-day wine tour through the Chianti region. Departing from Florence, a private English-speaking will drive you to a rustic cellar in the countryside to sip the region’s top wines paired with local snacks. If you choose the full-day option, continue on to enjoy a traditional Tuscan dinner in the Chianti hillside. Your tour will conclude with drop-off at your Florence hotel.